Since the 1973 Supreme Court decision in the case of Roe v. Wade, the question of the status of the human embryo (and fetus) has been at the center of heated political debate, typically focusing on the issue of abortion. Such debate has only intensified as disputes over stem cell research have entered the public consciousness as well. The ethical questions involved in these issues are numerous. The most significant question, however, is the one that is often overlooked as rhetoric about “choice” and “privacy” drowns it out. This question that must remain at the forefront of such debates is this: At what point does the life of an individual human being begin? 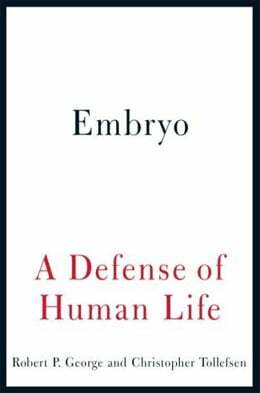 Embryo: A Defense of Human Life by Robert P. George and Christopher Tollefsen addresses this and other related ethical questions. Robert George is a member of the President’s Council on Bioethics and is a professor of jurisprudence at Princeton University. He is the author of several books including Making Men Moral and In Defense of Natural Law. Christopher Tollefsen is an associate professor of philosophy at the University of South Carolina. He is the author of the forthcoming book Biomedical Research and Beyond. Human embryos are not…some other type of animal organism, like a dog or cat. Neither are they a part of an organism, like a heart, a kidney, or a skin cell. Nor again are they a disorganized aggregate, a mere clump of cells awaiting some magical transformation. Rather, a human embryo is a whole living member of the species Homo sapiens in the earliest stage of his or her natural development (p. 3). The authors argue that the embryonic stage is, like the fetal stage, the infant stage, and the adolescent stage, one stage in the development of a single human being who begins his or her existence at the point of fertilization. Based on this, the authors argue that the human embryo is a human person worthy of full moral respect and that it is “morally wrong and unjust to kill that embryo, even if the goal of the embryo killing is the advancement of science or the development of therapeutic products or treatments” (p. 17). Unlike many books defending the moral worth of human life before birth, George and Tollefsen argue on the basis of natural law rather than on the basis of any explicitly religious claims. Their book is structured to address four possible ways of refuting their basic thesis. The first claim addressed is the denial “that the early human embryo is a human being.” The second claim addressed is the denial “that persons…are to be identified with the biological entities that are human beings.” The third claim addressed is the denial “that all human beings deserve full moral respect.” Finally, the fourth claim addressed is the assertion that “we can both respect the embryos in the way they deserve and use them in research involving their destruction” (pp. 22–25). Although the book is relatively short, at only 242 pages, it is not exactly light reading. There are detailed discussions of embryology, philosophy, and ethics. The book, however, is well worth the effort, even for those who are not familiar with one or more of these fields. The issues raised in this book affect us all because the tax dollars of each of us may be put to use funding some of the kinds of research described by George and Tollefsen. For those who are involved or interested in the debates surrounding abortion, euthanasia, stem cell research, in vitro fertilization, cloning, etc., and for those interested in how natural law could be applied to such questions, Embryo by George and Tollefsen is an important contribution. This book will likely spark much discussion in the coming years and may very well prove to be a landmark book.